Chainsaws, zombies, fake blood, mummies and strobe lights all mean one thing. 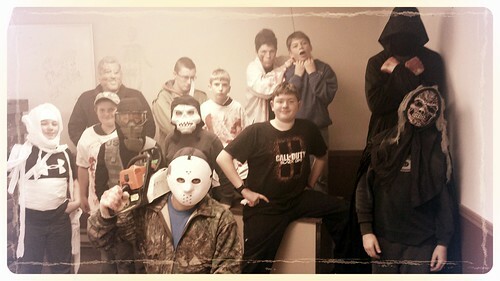 Troop 45 is having a haunted house! What a turnout! I lost track of the number of groups that visited this year’s haunted house, but our estimates say that at least 60 people walked through. Well, we use the term “walked”, very loosely. Some ran and some turned back! The boys pulled one of their best haunted houses, ever. With acts ranging from the Angel of Death who walked up behind the guests, to the Mummy in the Coffin, we were delighted to spend some time with Pack 45 as their youth and parents came through. For those that don’t know, the boys fully plan and build the entire haunted house, by themselves. They come up with the acts, the props and the walk-through plan. Our adults walk through to verify safety and pick up the pizza, but the show is all up to the boys. In the process, they get to exercise leadership while having an incredibly fun time. After the boys finished for the night, they completely restored the building, then hang out for a movie, ate some ice cream and had one more night of camping on the Legion grounds. Be sure to click on the picture at the top for a link to more photos of this awesome event. This entry was posted in News and Events and tagged Haunted house. Bookmark the permalink.